In today's mailbag, we found a question asking about our unique way of calculating Quality of Correctness for pitches—balls or called strikes. Sometimes, our QOC doesn't seem to match with what's seen on TV, BrooksBaseball, or another visual strike zone box/display. Which computer is best at calling balls and strikes anyway, and why is our site so umpire-friendly? A pitch .03" into the strike zone is a strike. It all goes back to the mission of Close Call Sports and the Umpire Ejection Fantasy League: to objectively track and analyze close calls in sport with great regard for the rules and spirit of the game. The way a strike zone box seen on a television broadcast, Statcast (f/k/a Pitch f/x), or even Brooks Baseball's standard plot works is to convert a baseball's physical coordinates, tracked using an in-stadium measurement system, to a graphical representation. Everything gets coordinates assigned to it—including the strike zone "box"—and these coordinates dictate where these graphics will appear on the screen. px = Horizontal measurement of the baseball, in feet, as measured from the center of home plate. pz = Vertical measurement of the baseball, in feet, as measured from the ground. 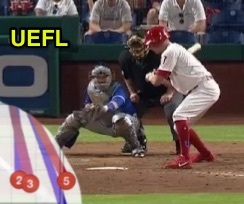 sz_bot = Measure of the bottom of the batter's strike zone (hollow-of-knee). Often a static number. sz_top = Measure of the top of the batter's strike zone (midpoint). Often a static number. RAD = Radius of a baseball. Generally, + .123 feet, or 1.47-inches. MOE = Margin of error. Per the manufacturer, it's about an inch, or .083 feet. QOC = Quality of Correctness. Whether the pitch was properly officiated (QOCY) or not (QOCN). >> (Measures in feet, all else equal) |0| < STRIKE < |.748| < BORDERLINE < |.914| < BALL. >> (all else equal) BALL < sz_bot - RAD - MOE < STRIKE < sz_top + RAD + MOE < BALL. Related Post: Dude, What Happened Last Night? About Pitch f/x Error (8/30/16).Related Post: Analyzing Strike Zone Analysis - Not So Easy or Simple (10/27/16). Related Post: Zobrist - Computer Ump Would Have Called Strike 3, Too (8/15/17). Related Post: Pitch f/x SMT Sportvision Sues MLBAM for StatCast 'Theft' (5/21/18). Related Post: Game of Millimeters - Hoskins Talks West's Strike 3 Call (5/26/18). With Brooks, we sometimes disagree. Brooks Baseball: I like to use Brooks' plots to explain because it's the simplest, most straightforward tool out there I know to pinpoint the px, pz coordinates of a ball and then represent this singular location on the screen. The problem, naturally, is Brooks gives, and displays, a pinpoint node for each pitch. By doing so, the physical properties of a baseball—namely its spherical volume, radius, etc.—are ignored, which is problematic when the definition of a strike holds that a pitch is a strike by location if any part of the baseball passes through any part of the strike zone. The "full game" strikezone plots offered by Brooks, additionally, fail to account for individual batters' sz_bot and sz_top values, for if it did, the graphic would likely be unreadable. We refer to this as a non-normalized plot because the values on horizontal and vertical axes are to scale, specifically in feet. Some plots offer a way to standardize the various batters' heights by applying a "stretch" variable such that sz_bot and sz_top will display consistently, in the same location, for all batters. We refer to this as a normalized plot because the values on the horizontal and vertical axes are not to scale, but in normalized units instead, so that sz_bot and sz_top will line-up properly for all batters regardless of their actual zone heights. The trade off here is that the pitched ball's locations are not absolutely represented, since they are relative to only one particular batter, which is indistinguishable from any other batter plotted on the same chart. To account for these inconsistencies, we trace things back to the root of the problem: the graphics themselves. In lieu of strike zone graphics that are known to be inaccurate, subject to interpretation error, or other visual issues, we take the raw numbers for px, pz, and the zone heights, using only numbers in our QOC calculations. 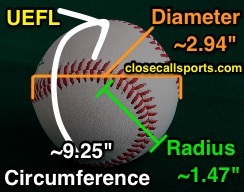 To account for the physical properties of a baseball, knowing that pz and px are measured at the center of the baseball, we use the radius of a ball in our Kulpa and Miller Rule calculations. A baseball is a sphere with physical properties. Margin of Error. Popular pitch trackers never take into account MOE despite the technology manufacturer's admission that the pitch trackers can be wrong by up to about one inch of MOE. Because of our philosophy that an umpire should not be credited with having made an incorrect call unless there exists ample evidence ("clear and convincing," these days) to prove the incorrectness of the call, if a pitch is thrown within the margin of error such that either "ball" or "strike" could be accurate, depending on how close to an inch the error was (and in what direction the error was), we deem the call QOCY (correct) for a lack of evidence to conclusively prove otherwise. Because we use numbers and not graphics, we don't have to worry about an image looking blurry or "busy" as a result of the various RAD and MOE applications. Refer back to Kulpa and Miller for further explanations of how we interpret the data.